I'm back with part 2 of my horror movie marathon reviews. Again, I'm looking at movies currently streaming on Netflix, and the movie descriptions (in italics) are provided by imdb.com. So here's what I thought of some of the movies available right now. "Tensions rise within an asbestos cleaning crew as they work in an abandoned mental hospital with a horrific past that seems to be coming back." This is a bit more of a psychological thriller than a ghost story. 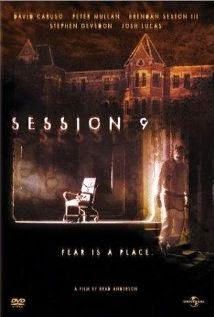 One of the best things about this movie, is that it was filmed on site at the abandoned Danvers Mental Hospital in Massachusetts- a place that is rumored to be haunted in reality. So you can expect the setting to be suitably eerie. In fact, actor David Caruso claimed to have seen something strange while filming. Very spooky. As far as the movie itself- Whew! It was sooo creepy. It begins slow, but as the sense of foreboding builds, the movie becomes intense, and the final scenes are fairly shocking. "Bestselling novelist Mike Noonan, unable to cope after his wife's sudden death, returns to the couple's lakeside retreat in Maine, where he becomes involved in a custody battle between a young widow and her child's enormously wealthy grandfather. Mike inexplicably receives mysterious ghostly visitations, escalating nightmares and the realization that his late wife still has something to tell him." 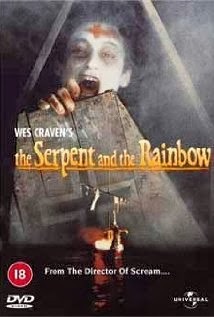 This was a Stephen King novel that I really enjoyed, and they turned it into a fairly good adaptation that, if I recall correctly, was released on television initially. In any event, it's complete here, and it has some pretty good scary moments, some decent characters, and a decades-old murder mystery that needs to be solved. I did think that Pierce Brosnan was an odd choice for the main role, though. Maybe it's just me, but he's not how I pictured the character in the book. He's a bit stiff for me- he never seems very emotionally connected to the other characters. Or maybe I just still can't help seeing him as James Bond? "Troubled divorcee Mary Kee is tormented by a series of sinister phone calls from a mysterious woman. When the stranger reveals she's calling from the past, Mary tries to break off contact. But the caller doesn't like being ignored, and looks for revenge in a unique and terrifying way." I liked this. It was another slow-burner, but it had a few really good creep-out moments. It's more spine-tingling than terrifying. You might recognize Rachelle LeFevre from the recent TV series, Under the Dome. She is a great actress in that series, and I enjoyed her performance here as well. "A young couple move into a new apartment, only to be surrounded by peculiar neighbors and occurrences. 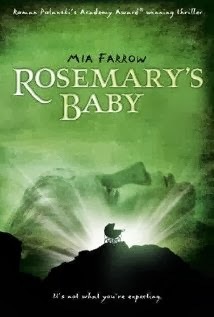 When the wife becomes mysteriously pregnant, paranoia over the safety of her unborn child begins controlling her life." This is another classic of horror. Personally, I find most of this movie quite unsettling...up until the end. It seems comical to me. I always kind of giggle at the Adams Family-esque black cradle for the baby, and the ridiculous cultists. But it's one of those movies that you need to see if you haven't. It was filmed in the 1960s, and the underlying themes center around women's issues- think The Yellow Wallpaper. (By the way, if you've never read that, I strongly suggest you do.In fact, read it here, free.) Rosemary is in a similar position, except that the woman in the short story is being convinced something is wrong with her, whereas Rosemary is being told that nothing is wrong. "A group of high school friends reunite years later for a weekend of partying and catching up on old times. 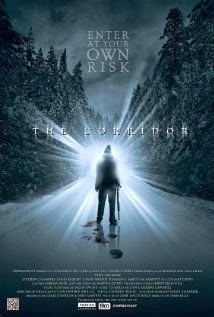 Isolated deep in the snow covered forest, they stumble upon a mysterious corridor of light. Like a drug, the corridor's energy consumes them, driving them to the point of madness. One by one, they turn on each other, taking their evil to the next level. Mayhem leads to murder as they race to outlast each other, and the corridor's supernatural powers." This was a mind-bender, that had some seriously creepy moments. However, it was incredibly gory for a portion of the movie, and I could barely stand to watch. There is a huge amount of tension in this film, as slowly the campers begin going mad, and then become strangely violent or self-destructive. The ending left me still confused, but I don't think they meant for you to truly understand what the corridor really was. Suffice to say, it's dangerous. "An anthropologist goes to Haiti after hearing rumors about a drug used by black magic practitioners to turn people into zombies." It's a zombie movie that's actually about "real" zombies. There are people who believe that they can transform others into the walking dead. There's a nice article about it here. In fact, the movie is based on the real account and research of Wade Davis. Based on...mind you. 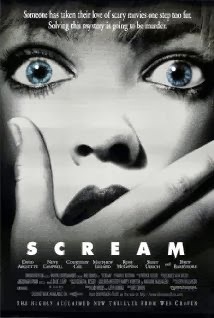 Wes Craven of course, takes the ideas from the book and crafts a horror tale around them. As far as how scary this is- I would say I found it more disturbing because of the basic premise- that anyone can be taken over and forced to become a mindless slave. Some of the scenes are trance-like and bizarre, while others are definitely startling. I think the main draw for this movie is that it is so unique in the genre. It feels more like a psychological action movie with elements of horror, than just pure horror movie. "A successful Wall Street trader returns to England with her new husband and five-year-old son, but their new start together turns into a nightmare when they move into a country house which contains a terrible secret." 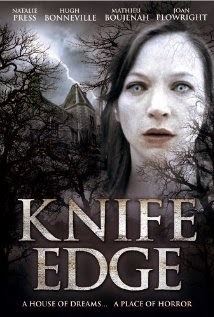 This was overall bland with small moments of eerie happenings sprinkled throughout. It's a murder mystery with a ghostly element. There are lots of movies like that, and this one isn't impressive in any way. It doesn't stand out. Even so, it's not horrible, and if you're looking for a horror flick and you can't find anything else that interests you, then give this a try. "Wilbur Whateley pops over to the Arkham Miskatonic University to borrow the legendary Necronomicon and Sandra Dee. But little does anyone know, Whateley isn't quite human." 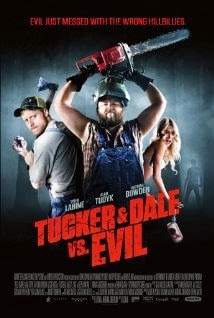 "Tucker & Dale are on vacation at their dilapidated mountain cabin when they are attacked by a group of preppy college kids." This is hilarious. 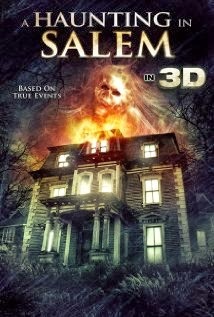 It takes the typical slasher film and turns it on its ear. For once, the backwoods hillbillies are the nice guys who are just trying to mind their own business, but the college kids make some assumptions about them based on some really funny coincidences. So, the college kids determine to fight back...but they keep getting themselves killed. I have never laughed so hard at someone being wood-chipped to death. And then cops get involved, and it all goes downhill from there. Alan Tudyk and Tyler Labine are fantastic in this. A MUST-SEE! "In Italy, a woman becomes involved in a series of unauthorized exorcisms during her mission to discover what happened to her mother, who allegedly murdered three people during her own exorcism." This is an example of the found footage films that I get tired of. First of all, we've seen SO many exorcism movies in recent years, and SO many found footage, or documentary style movies, and this one just doesn't stand out in either category. The only thing unique about the exorcism aspect was the ideas of multi-being possession and transference. So, basically there were multiple demons in a lady, and the demons could transfer to other people close by- even priests attempting exorcism. That was pretty cool. On the other hand, the rest of the exorcism scenes are just standard fare for the genre- contorting limbs, screaming, speaking in tongues...you get the picture. And I am so tired of shaky, jumpy camera work. So, it's not horrible...I just didn't enjoy it as much as I had hoped. 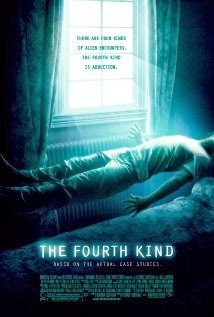 "A team of parapsychologists try to figure out a strange phenomenon occurring in an apartment building." This was ok. 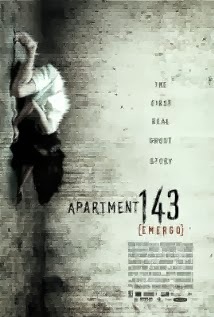 It's a found footage style film, and it's not the worst one I've seen. There are quite a few startle-scare moments, and it builds up to a much more aggressive haunting than the Paranormal Activity movies. There were some pretty big flaws, though. The professor-type investigator seems so flat throughout everything that's happening. You would think given the level of insane activity that happens in this house, that he'd be willing to entertain an idea that this is more than just a girl with schizophrenia manifesting some psychokinesis. His determination to stick to science is almost ridiculous, given the happenings in the movie, so he seemed unbelievable as a character. They also never really answer what was going on, and they hint at things to be discovered, so the let-down of not getting to discover them is sort of unforgivable. "A thriller involving an ongoing unsolved mystery in Alaska, where one town has seen an extraordinary number of unexplained disappearances during the past 40 years and there are accusations of a federal cover up." I was legitimately scared by this movie. I mean, they begin the darn thing with a statement about how they will be using actual footage interspersed with acting. That made me stop and say, "Whoa, really? I'm intrigued now. This might be a real event." As I was watching, it was quite frightening, but about halfway through, I started doubting. I don't want to spoil it for you, so...watch it first, google the darn thing after. I think not being sure if it is real or not is part of the fun of this one. 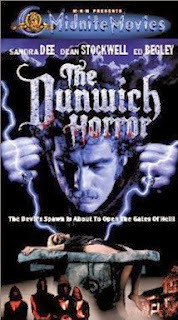 "In this spine-chilling indie horror flick, a sheriff relocates to Salem, Mass., with his family -- only to discover that the house they've moved into is plagued by an ancient curse and haunted by malicious spirits." Oh wow. This is a stinker. This is about as well done as Sharknado, but seemingly not on purpose. A sampling of ridiculous things: A kid is drowned in a bathtub, and for some reason the water is green and smoking when this happens. Why? Was he drowned in a vat of acid? No? Hmm. A girl who has been sick for days pulls a tooth out of her own mouth, and her mother rushes in to put hydrogen peroxide on it. But we're not going to the hospital or anything...this sort of thing just happens, right? Oh and at the same time Mom is applying hydrogen peroxide to daughter's tooth, there's a citizen of the town boiling her own face off in the kitchen. No one seems to notice, not even the cop who is then seen standing on the porch. Later, the sheriff is thrown out a second story window- a fall which killed the first sheriff, but he gets up after a few minutes and doesn't seem to even have broken bones. And then there's the casting. The sheriff is played by a guy who looks like he's in his mid 40s, but he's married to a much more attractive woman who looks mid thirties at best. One of them should have been swapped out. They don't look right together. Apparently, this is a common complaint of movie critics, (Well...sounds like most people were harsher than I am) because the poor guy issued a statement about his involvement in this movie and apologized to movie watchers. Oh my gosh. I say watch this if you want a silly horror movie. Giggle at it. The value in this is the ridiculousness. 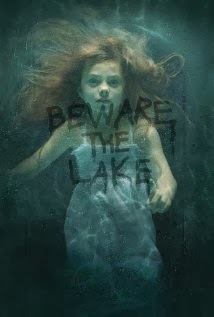 "A killer known as Ghostface begins killing off teenagers, and as the body count begins rising, one girl and her friends find themselves contemplating the "Rules" of horror films as they find themselves living in a real-life one." Probably almost everyone has seen this. That's because it really was a good horror flick. I saw it first in a drive-in theater near my home town, and I loved it. It has become a modern classic for me. Everyone knew, when I was a kid, that there were "rules" of slasher films. We talked about them at sleepovers and with our other nerd friends. But this movie cemented what we all joked about, and maybe it was the bit of humor in it that caused it to be so scary. I remember discussing with friends- if you were in a horror movie, would you live or die? This movie took that question seriously. "Oskar, a bullied 12-year old, dreams of revenge. He falls in love with Eli, a peculiar girl. She can't stand the sun or food and to come into a room she needs to be invited. Eli gives Oskar the strength to hit back but when he realizes that Eli needs to drink other people's blood to live he's faced with a choice. How much can love forgive? Set in the Stockholm suburb of Blackeberg in 1982." This is a great movie. 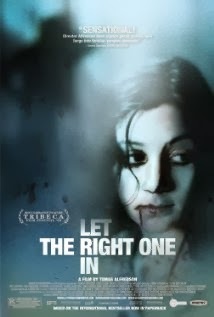 This was the original Swedish version before it was remade into "Let Me In" by an American crew. I find the remake unnecessary. The only thing it improved was maybe removing the need to read the subtitles. Other than that, I prefer this version. Things I love about this: the children who played the two main characters...they were so wonderful in this; the setting- the stark, cold Swedish winter feels like a metaphor for the loneliness of Oskar and Eli; and the balance of Eli's character- you feel a mixture of sympathy for her and fear of her. The movie left me unsure of what I wanted the outcome to be, and it's a very intelligent film in that regard. It isn't meant to just shock you or startle you, but to make you feel and think. Originally posted at my other blog, Logical Waffles.